I work as a Digital Marketing Specialist in our Student Affairs Creative Unit, an in-house creative agency. For the last 3 months, however, I have been on a secondment to our Career Centre to help improve student engagement, storytelling, marketing, and personal branding. In my time at the Career Centre, there has been one project I’ve fallen in love with: the Master Class Series. 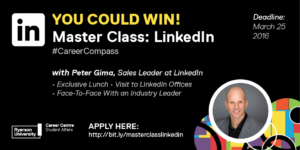 The Master Class Series was pitched as a way to promote their Career Compass Career & Job Search Guide. This is exactly the type of program I would have loved as a student at Ryerson and one current students helped inform (I do most of my brainstorming with students). Master Class was a series of intimate lunch and learns for a select group of students and an industry leader at the leader’s place of work. 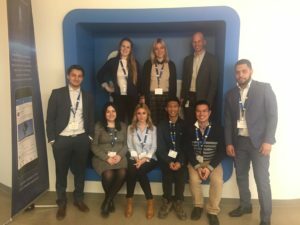 Rather than bringing the employers and professionals to campus, we would bring our students to the company and have them learn invaluable knowledge from an experienced professional. Students had to apply to be a part of it so that we could ensure attendance and diversity of faculty, year, and experience. We started by asking students in a blog to tell us in 100 words or less what topic from Career Compass they would ask Peter Gima about. We wanted to see how the students communicated, but also wanted to ensure they had to use Career Compass to qualify. We received many more applications than we were expecting from students in all years and faculties. Through deliberation, we selected a diverse group of winners. We met our 8 students and made our way over to Blaze Pizza where each student picked up their pre-ordered personalized pizza. We walked over to meet Peter where we had our intimate lunch and learn in a LinkedIn board room. We prepared a deck ahead of time that had all of the students’ questions on it, but Peter went above and beyond to pre-search each student’s LinkedIn. He came prepared with individualized notes for each of their profiles. The students all left with practical knowledge about how to improve their LinkedIn profiles and advice from a professional who has been involved in the hiring process for dozens of people. I captured the whole experience using RU Student Life’s Snapchat. Each piece of our story had over 300 views. Check it out below. The Master Class Series is exactly the kind of programming we aim for in #RyersonSA: it’s good, it’s different and it’s impactful. It’s informed by students and just as importantly, by our values. 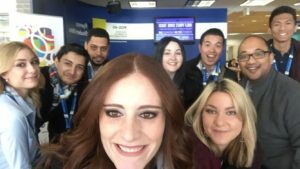 I learned the Career Centre had defined values that needed to be infused into this program. To see the details of these values, click here. Continuous Improvement & Innovation Brands outside Ryerson are creating these holistic experiences for consumers all the time. We are ensuring we’re standing right there with those brands meeting the expectations of our millennial students. Community Engagement We are engaging with companies and employers, and creating meaningful ways for Ryerson students to be seen and connect with them. Equity, Diversity, & Inclusion In choosing the students and expert hosts, we are intentional about looking for diversity of background and experience. High Impact Experiences Through small class sizes and 1-to-1 interactions in the company’s space, we are creating a high-impact experiences for the students involved. Operational Excellence I have documented all tasks, processes, and templates I used for the Master Class so that the program may continue on seamlessly without me. The cost for running this program is time and the price of lunch. I’m happy to say the first ever Master Class was a success and the program will be continuing on. After the success of our first one, CIBC and Facebook have already signed on to be the next hosts. As I head back to Creative, I’m excited to see where the Master Class Series goes. I’m happy I was part of laying the groundwork for what I think will be an amazing program, keeping RyersonSA and our Career Centre at the forefront of modern Career Development in Canada.